Luke Kunin and Kyle Rau were recalled by the MN Wild Monday as the club desperately searches for a spark and some speed. Following a pair of losses against Dallas and Chicago the hockey club recalled forwards Luke Kunin and Kyle Rau from Iowa. 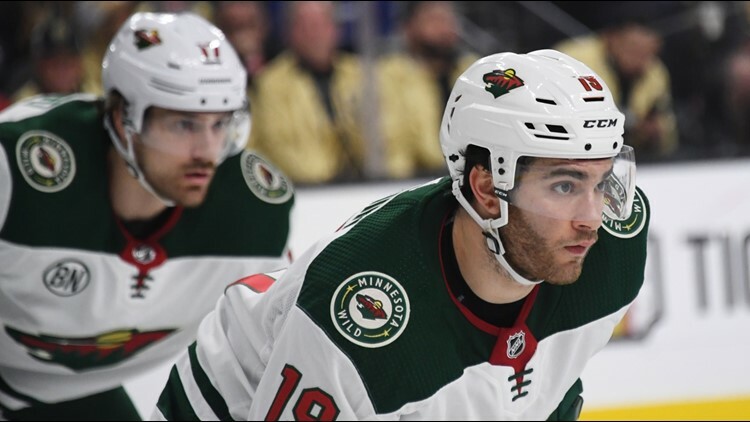 ST PAUL, Minn. — Desperate to find some speed and scoring after a poor start to the season's second half, the Minnesota Wild has given the roster a minor shakeup. Following a pair of losses against Dallas and Chicago the hockey club recalled forwards Luke Kunin and Kyle Rau from Iowa. Forward J.T. Brown and defenseman Nate Prosser were assigned to Iowa after passing unclaimed through waivers. Kunin was starting to get some traction in the Wild lineup before the team went on All-Star break, so he was sent down to Iowa to keep his game sharp. He has accumulated five points in 21 games with the big club. Rau, a former Gopher, was leading the Iowa Wild in goals and had notched 30 points in 45 games. The acquisition of two defensemen (Anthony Bietto, Brad Hunt) shortly before the All-Star game pushed Prosser down the depth chart. The Elk River native had only been active for 15 games this year. Brown has been in and out of the lineup as well, skating 35 games for the Wild after signing as a free agent. The Wild play Tuesday at home against the Buffalo Sabres. Despite their two consecutive losses the club still holds the top wild card playoff spot.